Four years after the “big bike race” made the topic a point of debate in Richmond, the city is on the verge of adopting new rules that would make short-term residential rentals permissible. The city planning department is soliciting feedback on a draft policy to regulate nightly rentals of rooms and homes such as those marketed through websites like Airbnb, FlipKey, HomeAway and VRBO. The proposed rules were presented to the planning commission this month and are being circulated for review before going to the commission and City Council for potential adoption. Read the draft rules (PDF). The new rules would require anyone looking to rent out a property for less than 30 days at a time to obtain a permit, called a Certificate of Zoning Compliance for Short-Term Rental, at a cost of $300 to cover administration and monitoring costs to the city. Properties found to be operating as short-term rentals without a permit would be fined $500 and ineligible for permits if they receive more than one violation. The rules come four years after council called for changes to the zoning ordinance to allow for such rentals, which are currently prohibited under city code but allowable with a special-use permit. The directive came in 2015, the same year Richmond hosted the UCI Road World Championships, when hundreds of area properties were offered up as rentals. 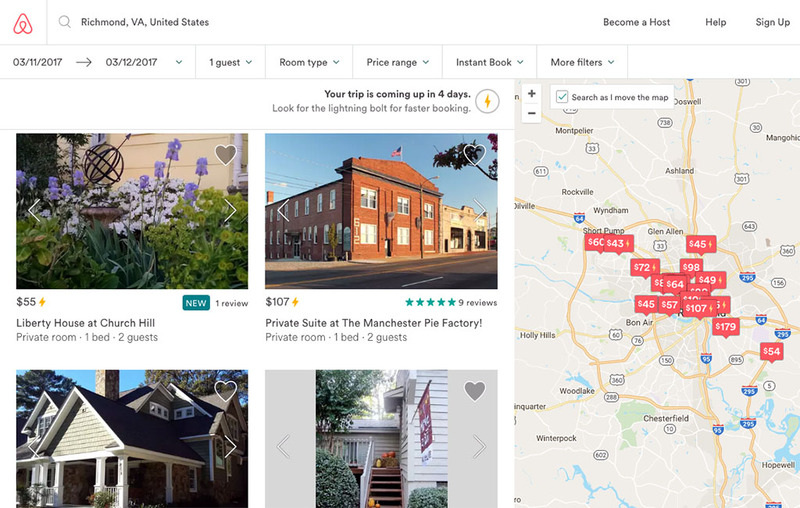 The city issued a report at the time recommending regulation of what it described as a “new tourism model,” but work on a policy stopped the following year, when the General Assembly was considering limits or restrictions on regulating short-term rentals on the local level. The adoption of Senate Bill 1578 the following year allowed localities to draw up their own regulations, and the city proceeded with drafting its proposed rules based on those laws and known rental activity in the region. Senate Bill 1578 allowed localities to draw up their own regulations for short-term real estate rentals like AirBnB. According to statistics provided with the proposal, Richmond had 835 listings in March 2018, representing 749 unique rental units primarily concentrated in the Fan and Museum districts, Church Hill and downtown. That’s up from the bike race three years earlier, when a search by BizSense found 244 rentals for a one-night, one-person stay in the days leading up to the event. 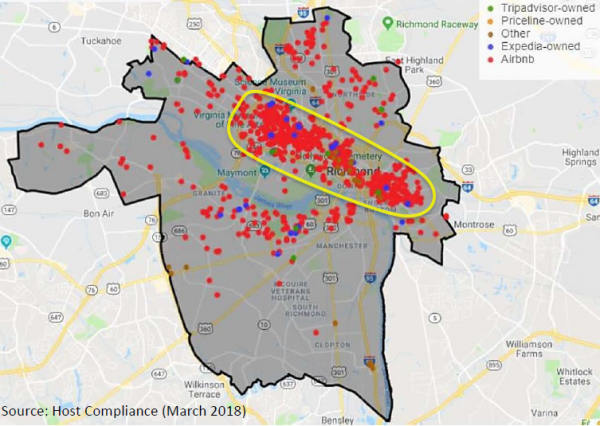 According to AirDNA, a short-term rental analytics site, Richmond had 643 active rentals listed as of Friday, with an average daily rate of $119 and a 60 percent occupancy rate. About 400 of those were homes, just over 200 were private rooms and just a handful were shared rooms. 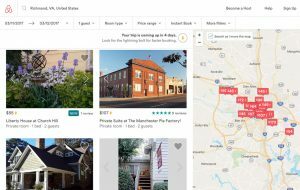 Nearly all of the listings were on Airbnb, with 3 percent on HomeAway and 4 percent on both sites. There were 135 rentals listed in Henrico, 11 in Hanover and 10 in Chesterfield. 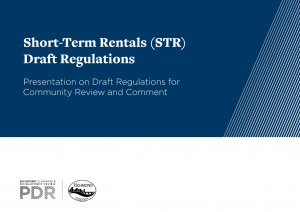 The proposed city rules would allow short-term rentals as a permissible accessory use in all city zoning districts that allow residential uses. All types of dwellings would be allowable under the rules, including accessory dwelling units, so long as such dwellings are the operator’s primary residence, meaning he or she lives there at least 185 days a year. Certificates would be good for two years and compiled in a registry of approved operators. Approval numbers would have to be posted on ads for rentals. Both property owners and tenants could qualify for permits, though permits for tenants would require property owner approval. Condos and co-ops would require approval from their respective boards. Rentals in apartment buildings and other multifamily or mixed-use properties would be limited to nine units or 25 percent of the total number of units, whichever is less. Properties could be used as a short-term rental no more than 180 nights in a year. Generally, rentals would be restricted to two adult lodgers per sleeping room, with no more than five sleeping rooms allowed per rental. Limits would not be set on the number of children allowed with adult lodgers. Rentals with four or more bedrooms would be subject to the city’s 8 percent transient occupancy tax. Operator can stay. Or not. Both hosted and non-hosted rentals would be allowed, as operators would not be required to occupy a property during a stay. The rules would not include additional regulations on parking. Violations of regulations beyond the registration requirement would make a property ineligible if three or more violations are given on three occasions. Violations would qualify as a misdemeanor and carry fines of between $10 and $1,000. The city would hire a third-party vendor to monitor compliance and facilitate enforcement. According to the presentation, the city received four complaints about short-term rentals in 2018. The city is circulating a survey to receive feedback on the proposal. The survey, available here, can be taken through May 31. While the city circulates its proposal, other localities in the region are mulling their own policies. Henrico County is reviewing regulations that first were proposed in January but were deferred again last month. The county planning commission is scheduled to take up the rules at a meeting in June. Goochland County has rules that are posted on its website. Chesterfield and Hanover do not have formal policies but have allowed short-term or transient rentals with an appropriate permit. 7 Comments on "Short-term home rental permits would cost $300 under proposed city rules"
The only problem I see here is the plan to subcontract out the compliance and enforcement component. That will ensure violations at a level high enough to generate profits for the contractor. Kind of like the way privatized prisons guarantee maximum incarceration. Interesting, I wonder what Mr Battiston is thinking…..or calling his agent. What I am reading is that it MUST be your primary residential unit for 185 days a year so his store front transition would not work. You cannot just have a housing unit be a full time AirBnB. The forthcoming debate if this ever gets to Council will be lively. And Bruce has a good point; the enforcement will be interesting as the private firm is going to make it their first mission to make a profit. It is a bit confusing and there must be an out for the ownership thing because the article also says this “Rentals in apartment buildings and other multifamily or mixed-use properties would be limited to nine units or 25 percent of the total number of units, whichever is less.” So which is it? Do you have to live there or not? In either case the guys who wanted to do all AirBnB units (I think that is who you were referencing) won’t be able to do it. But would still be interested in a clarification about their rules of ownership. Mostly because it is technically not allowed at all right now and this would establish it as a use and set a general framework on how to regulate the few bad operators (bc they are out there). But mainly because there have been complaints from the hotel industry. There have also been complaints about renters who get out of hand and are basically using the houses to throw a house party and there have been complaints about unsafe facilities. I think most of them are reputable, but those few bad eggs ruin it for everyone. I agree with the private compliance, the city cannot and would not be able to police this as they cannot do so with their current complaints in a timely manner. The city should have been enforcing this issue years ago, it has been going on in Northside for years unabated.